The Le Mans TR7 story starts back in 1977 from a redundant Left Hand Drive TR7 that had been used by Janspeed as a development vehicle for British Leyland Motorsport. Jan Odor brought the car from BL, planning to modify it for Modsports racing but by the time the necessary parts had been gathered together, a change in the modsports rules thwarted the project. Instead the car was restyled with racing body panels and fitted with a turbocharged Rover V8 engine. 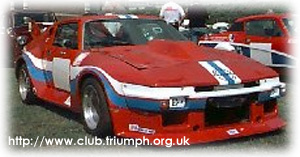 This TR7 Turbo was entered into the 1980 Le Mans 24 hour race - becoming first Triumph at Le Mans for 19 years and taking over 3 years in development from the purchase from BL Motorsport. ADA had tried to raise necessary sponsorship from the British motor industry, including BL, but the results were pitiful, causing a British Motorsport Tragedy; with this car arriving having undertaken no serious track testing beforehand. The car failed to qualify! Despite being timed at 201mph on the Mulsanne Straight it had previously achieved only 175mph due to drive shaft vibration and other minor problems. 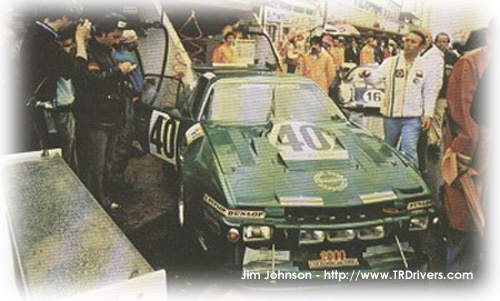 Undeterred ADA entered the Triumph TR again in 1981, employing Derek Bell for testing, and entering the car in the Silverstone 6 hour race beforehand. Initially the vehicle ran well - after previous testing comments from Derek Bell that the car, as it stood, was not anything like good enough. Unfortunately the car crashed heavily and with only having one car there was no chance of carrying out effective repair in time for Le Mans race, and so the entry was withdrawn. The final entry, by ADA, was in 1982 but this was withdrawn again - this time due to lack of funds -, which has been the Achilles heel for both Janspeed / ADA. A sad conclusion to the last TR entry at Le Mans. At the end of 1983 the car was purchased by the British Sports Car Centre, in Goldhawk road, West London and then the car was sold abroad. I believe the Car is still in existance.